Home Reviews If you're a foodie, don't miss this! 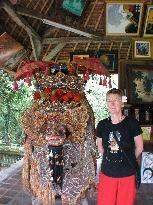 Our day with Paon Bali was the highlight of a week of wonderful Balinese experiences. Everything we had read about it was spot on - it was so much more than a cooking class. At the end of the day, we felt we'd learned so much about Balinese culture, had eaten some stunning food, and made a whole bunch of new friends. Puspa and Wayan are wonderful hosts, and their passion for the food and culture of Bali shines through. We've come home with a heap of ingredients, ready to make the many recipes we helped prepare.